Realvolve is the new standard for real estate technology. Realvolve software-as-a-service blends elegant design, emerging technologies, and practical, thoughtful features. Real estate is all about people. Realvolve keeps you connected.The power of The Realvolve Workflow Platform lies in its flexibility to handle everything from the most common systems to more sophisticated, conditional based workflows for your entire team, making your brokerage or personal practice more productive and efficient. The power of The Realvolve Workflow Platform lies in its flexibility to handle everything from the most common systems to more sophisticated, conditional based workflows for your entire team, making your brokerage or personal practice more productive and efficient. Record each contact’s personal and professional information and keep a journal of notes and correspondence. Maintain a collection of documents and files per person. Send email, SMS, and social media messages directly from the application. Track referral and lead sources.. Enter and review all vital information in a simple, clean user interface. List all parties participating in the sale or purchase of a property. Maintain an album of photos and a portfolio of pertinent documents. Keep track of your important tasks and activities. Track important events, such as listing expiration and closing dates. Keep detailed records of services performed for seller reporting. Calculate net commissions on each transaction. Manage your deadlines and capture important dates. Use the per-item calendar to view the dates and tasks for a single contact, property, or transaction. Use the system calendar to see all your events. Use powerful workflows to systematize repetitive tasks. Send and log incoming and outgoing posts, SMS messages, and email. Customize and send bulk email messages to your contacts. Collaborate and assign tasks to other members of your team. Choose what information you share with colleagues. Create/Edit HTML document templates for easy mail merge. Synchronize your contacts, calendar, and tasks with Google Apps, and synchronize your notes with Evernote. Add annotations and attachments to your data directly via email. Import information from almost any other CRM application. Automate processes with customized zaps in Zapier.com. Export contacts to Google Drive to print Avery labels and envelopes. Search for anything: names, addresses, tag, words, phrases. Categorize freely, using tags, to organize your data into searchable sets. Add files and images via drag and drop from your desktop..
Q. Do you need a CRM? Yes. While you can earn a living generating leads and selling homes without a CRM - if you want to build a True Business that lasts and performs in any market conditions, a CRM is essential. Q. Is Realvolve a "game changer" in Real Estate? Yes. 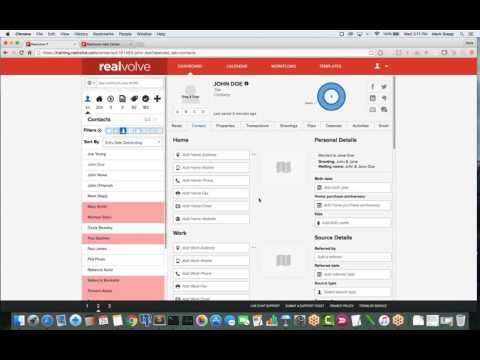 Realvolve improves on every aspect of CRM software. Realvolve builds on technology you use daily (such as the Web, email, Google Apps, and more) and helps you work smarter and more effectively, so you can focus on what matters most. People. Q. Does the Realvolve CRM do everything older legacy, industry CRMs do? More is not better...Better is better. We intentionally and deliberately keep things simple. We do less and ensure each feature we offer is thoughtful, practical, and beautiful. Q. Does Realvolve offer drip campaigns? Yes...but better. We offer you the ability to create any kind of campaign/plan/workflow that you like, limited only by your imagination. We don't offer pre-written drip campaigns because we don't feel that people like to be "dripped on" with generic meaningless messages. However, many of our Realvolve'rs have created workflows and share them with the Realvolve community for free in our rapidly growing workflow library. If you like one, it only takes a few clicks and it's installed! Q. can we manage the tasks, dates, people and documents in an escrow? yes , we can surely do using the contact management feature.